Choosing a coach is an extremely difficult process and there are many things to take under consideration. In the previous post we talked about personality, strengths, and credentials but there is much more to consider when choosing a coach. We also need to think about finances, availability, and standards. In most places figure skating coaches choose their own rates. Usually the higher the credentials of a coach the more they charge. Quality over quantity is important to keep in mind when choosing a coach based on their rate. I have known many people who choose a low level coach with a low rate over a high level coach with a more expensive rate because they will be able to afford a longer lesson time. In their minds a longer lesson equals more improvement. More often than not, a student will learn more in a shorter lesson with a high level coach than in a long lesson with a low level coach. The money can even be wasted when spent on the lower level coach because they can only progress so much with how they are taught. All coaches bill differently but the majority of coaches bill on a monthly basis. DO NOT PREPAY COACHES! There are exceptions to prepaying, but unfortunately there are greedy and sneaky coaches who ask advances that can end up being weeks and even months out. Those lessons never end up happening and the money is lost. Every coach has a different schedule and a different life outside of skating. Some coaches live and breathe for skating and are at every competition, test session, and available practice. Other coaches have families or other jobs and are not as available as other coaches. Before choosing a coach, ask their availability not only for lessons but for weekend events. This reason is not a make or break situation for choosing a coach but it is good to know in advance and be aware if the coach is always around or not. It is better to ask and to know what to expect than to find out later on and be upset the coach is not able to attend certain events. All coaches have a different style of coaching and with their different styles comes their level of standard. Some coaches may let things slide such as posture, toe pointing, or wearing a hooded sweatshirt to practice. Some coaches can be very strict with how you are dressed during a practice session. Their level of standards on how you look when you come to the rink often resemble their coaching styles. Competitive coaches are stricter on their standards than a recreational coach who doesn’t care if you wear jeans a hoodie to practice. Coaches standards are not only with attire but with how the skater skates. You can usually tell their standard by the majority of the coaches students and how polished their presence is on the ice. Toe pointing, extension, posture, and flow are all things that need to be reminded to the skaters constantly. Coaches with a lower standard don’t care about this and don’t emphasize it enough for the skater to make the correction. Competitions and testing are another good indicator. Some coaches make sure that their students are extremely prepared for the test or competitions where as other coaches have the approach, “we will see what happens.” Neither approach is wrong. It is a matter of personal preference what works with the skaters personality and what you are hoping to achieve from the event. The list could go on and on about how to choose a coach. Some reasons you can find out before hand and some things you may not realize until after you have had a few lessons with the coach. If you start out with one coach and it isn’t working don’t feel like you have to stay with that coach. Try another coach until you are happy with the work relationship. Your coach needs to fit well into your life. If they do, then you have found your coach. Starting out in skating can be incredibly confusing. How much should you be on the ice, how many competitions to compete in, group lessons or private lessons? One of the biggest and most crucial questions is how to find a coach. There are hundreds of coaches out there and although most clubs only have a few to choose from, you have to find the right coach for you. If you are skating for fun, if you want to be competitive, if you want to join a professional ice show, or if you want to become a coach knowing which direction you would like to take in skating will help narrow down your search for a coach. If you want to be competitive look for a coach who has trained to compete or has competed at a national or international level. These coaches will have more knowledge than a coach who had never competed. If you want to join an ice show, look for a coach who has performed in ice shows. If you want to become a coach, shadow multiple different coaches. Most coaches have a preference of what they feel comfortable coaching. If you can find a rink that team coaches, you are in luck and should take advantage of this situation. Many coaches are not willing to team coach because they are insecure about their coaching abilities and don’t want their students to work with anyone else. Coaches who don’t want their students going to camps are often worried that if their students work with other coaches and make progress that those students will realize that the coach they have is not coaching them correctly or in a way that they will understand. I believe that great coaches allow their students to work with other reputable coaches and should encourage them to attend to skating camps. Many coaches are saying the same thing to a skater but every coaches words it differently. One way of saying it may resonate more with the skater which is why working with different coaches can be so beneficial. Its hard to believe but qualified coaches are hard to come by. It is sad and although there are many nice coaches and a lot that may look good on paper; I have seen multiple coaches who lie about their credentials and extremely exaggerate in order to make themselves look more qualified. The levels they have passed themselves is a secure guideline to how good of a skater they are/were and their knowledge of jumps, spins, dance, etc. There are amazing coaches who have not passed tests but are still more than capable of coaching higher levels; however, these coaches tend to have more experience in other areas not on the ice. They are committed coaches and have usually gone to camps, clinics, studied hours of videos, shadowed other coaches and have gone to seminars. Ask the coaches about their other experience, who they trained with, what coaches they have worked with etc. Many coaches in smaller cities have only worked with 1 coach their entire life and although they are confident they may not be very qualified. If they have skated in a show with a famous skater, ask them details about the show. I have seen resumes where coaches say they skated in a show with a famous skater. In reality they did skate in a show with them, but it was a club show or a show where they didn’t need to try out and then they only skated in a group finale number. It is awesome experience yes, but stating it as they skated in a show with a famous skater can be misleading. Ask questions and get details. If the coaches are reputable, they will be more than happy to share details. A coach can have a huge impact in a students life due to the amount of time they spend together. It is important to find a coach who is a role model and has a good attitude. Take deep consideration if you are working with a coach or are thinking about choosing a coach who yells, make their students cry, or show signs of anger. Do you really want to skate or have your child skate with someone who yells and is angry? There is a difference between being tough on a skater and being down right mean to a skater. Coaches can be tough on the skater in a calm way. There is no reason to hit the boards or yell so much at the skater they cry. The coaches personalities can rub off on the skater. If the coach is stressed the skater may get stressed. If the coach is calm, the skater tends to be more calm. Would you rather be stressed or calm before competitions or test sessions? Some personalities don’t mix, period. There are some people who just get a long better than others and it is the same when finding a coach. If you have a coach or are looking into a coach that you don’t get along with you should probably look for someone else. Even if they are a great coach, how much are you going to respect or listen to them if you don’t like them? There are countless things to take into consideration when trying to find a coach and these are just a few. It is a big decision trying to find a coach, and although the options may not be bountiful it is still important to weigh the options. I want to start out by saying that this is not aimed towards all schools or teachers. There are many wonderful teachers and schools who are doing amazing work in shaping the lives of tomorrows future. This article is about the ignorant teachers and principals that let their personal opinions stand in the way of what is in the best interest for the students. It’s sad to see some schools deny their students opportunities that can lead to wonderful opportunities and achievements in their futures. We have heard it before, skating is not a sport. No, it is not a school sanctioned sport, but that does mean it is not sport. I strongly believe that although it is not a school sanctioned sport, students who figure skate should get the same rights as students who play sanctioned sports. Students in volleyball, track, basketball, etc are allowed to leave school in order to attend meets and events. Depending on the teachers and principals, figure skaters are not so lucky to have that privilege. By not allowing students to leave for non school sanctioned sporting events, what is that teaching us about being different and going for your dreams? It is like telling the students you have the option of being a scientist, mathematician, geographer or english teacher because that is all they teach at school. Anything else is not allowed. Students should have the option to be whatever they want to be and play whatever sports they want to play even if the school doesn’t offer that sport. I have seen it in schools and experienced it myself (and fought tooth and nail to overturn the ruling) that skaters are not allowed to leave for competitions or extra training. Some teachers and principals understand and allow it and I commend and appreciate those who do. Those who deny it; however, I am disgusted by. Teachers have a huge influence on a students life. I distinctly remember, and always will, the two (yes only 2 from grade 1-12) that believed in me and supported my skating. If a student is learning in your class and achieving good grades, why should they not be allowed to leave? I understand not allowing the child to leave school if their grades are failing, but if their grades are high then what is the harm? Letting them attend their event not only allows them to do what they love, but it will also teach them about time management, balance, and independence. If they are away and not in school, they still need to finish their homework and study on their own. Balancing skating and school together is quite an accomplishment and they should be rewarded instead of punished for it. Teacher or no teacher, anyone that denies a child a chance to better themselves should be ashamed. I can guarantee that if a student makes it to the Olympics or if they get any name recognition in their sport all of a sudden their school is proud and supports them. When it comes to actually putting in the time and training the athlete only gets flak and the school makes it difficult for them. It is only when they are successful that certain schools want to share in their success. If you are dealing with non supportive teachers or principals, do not let it affect you’re skating or hold you back from your dreams. Voice your concerns and problems you are having. Plan a meeting with the superintendent, attend school board meetings, have your coach speak with your principal or teachers. Do anything and everything you can in order to address the situation. You can also look into independent studies in school so you will not have to associate with any teacher that is giving you difficulty. Just because a teacher is stubborn about their opinion doesn’t mean it should or can prevent you from furthering you’re skating. Teachers and schools have a huge impact on a students life. I am deeply bitter towards school and many of the teachers who taught me growing up. How they acted and the things they said towards not believing in my skating, that it wasn’t a sport, I was wasting my time, etc was just plain wrong. I am now coaching students who are facing the same challenges and to see them having to struggle through it is incredibly painful. I had the mindset to prove everyone wrong, but there are many students out there who will not be that strong and will give up instead. Teachers can either make or break an athletes future. Don’t let your teacher hold you back from following your dreams. You have been training hard and you are at your peak! Your jumps are solid, spins are fast, and every movement you make feels natural. And then BAM, an injury takes you out. Unfortunately in life there are unpredictable injuries. There are countless exercises and percautions that can be taken to avoid getting hurt, but that doesn’t always stop fate from intervening. The injury might not even happen skating, but it can still effect or prevent you from performing in your sport. 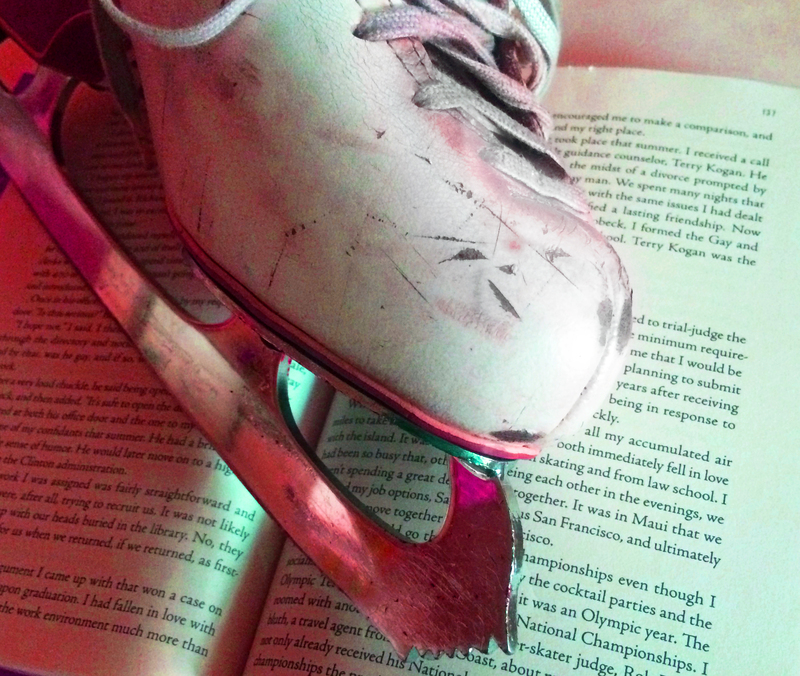 The discouragement from the set back of an injury is often times the reason why skaters hang up their skates. There are hardships, set backs, and just plain bad luck in everyone lives. It is incredibly discouraging when you’re skating is going so well to have it interrupted by an injury. Whether it is an injury that takes you away for a week or a year it can take a toll on your mental health. The injury is preventing you from doing what you love and what identifies you. I am a skater, but with an injury that keeps me off the ice what am I? Some skaters may encounter serious injuries that prevent them from doing everything they once were able to do, but that doesn’t mean they have to give up on skating forever. If you are no longer able to do freestyle, you can still do ice dance, moves in the field, professional shows (you do not need to jump in all of the shows) or coach. The possibilites in skating are endless. Just because you have an injury doesn’t mean the road is closed. You may just need to take a detour or create a new path to follow. Every injury is just a bump in the road that is a learning experience. An injury is not a reason to quit; it is an excuse. Try not to let the injury be a failure, but instead make it your reason to be stronger. You shouldn’t want someone or something to tell you when to quit something you are passionate about. You are the only one who should decide if you are going to hang up your skates. It may not be easy recovering from an injury, but if you love it there is always a way to have skating in your life. It kills me to see skaters so proud of themselves for how they skated and then be crushed when the results are posted. They could have a great skate for themselves and be on cloud 9 until they see their name posted at the bottom of the list. Competitions are a wonderful way to gain motivation to see how you can improve based on others, but in the end you should be your only judge. You never know how much time, commitment, money and training anyone else in your group has put in. All you know is what you have done and how far you have come. If you haven’t trained as hard as you could have, you know you need to for next time. If you have trained as hard as you could, then you should be happy knowing you gave it your all. Many times skaters don’t realize how much the other skaters in their group train. Instead of getting discouraged from your placement be encouraged by it to train harder and stronger for next time. Skaters continuously are moving up in levels and it is always hard to compete the first time at a higher level. It is often times a learning experience and you may not win right out of the gates. Again, you need to remember that other skaters may have been in that level for a few years or have been working on the harder jumps for more years. 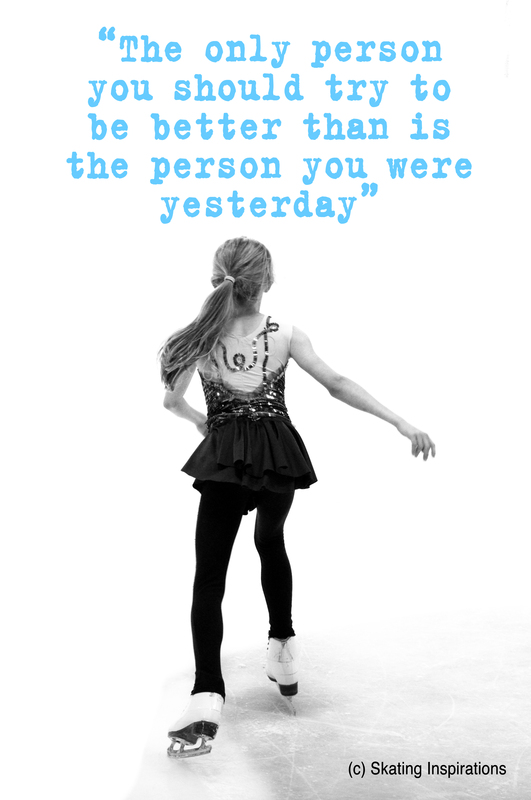 If it is your first time competing at a new level, learn from the other skaters and see what you could improve on. Most importantly, remember how much you have improved instead of comparing yourself to others when you don’t know their history. Everyone trains differently. Everyone performs differently under pressure. And everyone goes out and tries their best. That is all you can do is go out and try your best. Even if the placement is not what you had hoped for, just remember how you skated in the past. If you have improved since the last time, you are a winner no matter what the paper results read.